We are part of the worldwide Ukrainian Catholic Church, which is an Eastern Catholic Church in full communion with the Roman Catholic Church. Although it is not widely known in our Western world, the Catholic Church is actually a communion of Churches. According to the Second Vatican Council, the Catholic Church is understood to be “a corporate body of Churches,” united with the Pope of Rome, who serves as the guardian of unity (LG, no. 23). At present there are 24 Churches that comprise the Catholic Church. Each Church has its own hierarchy, spirituality, and theological perspective. Because we are in full communion, Roman Catholics are welcome to receive the sacraments in our church. To learn more about Eastern Catholicism, please visit The Eastern Catholic FAQ. The Ukrainian Catholic Church was persecuted by the Communists. 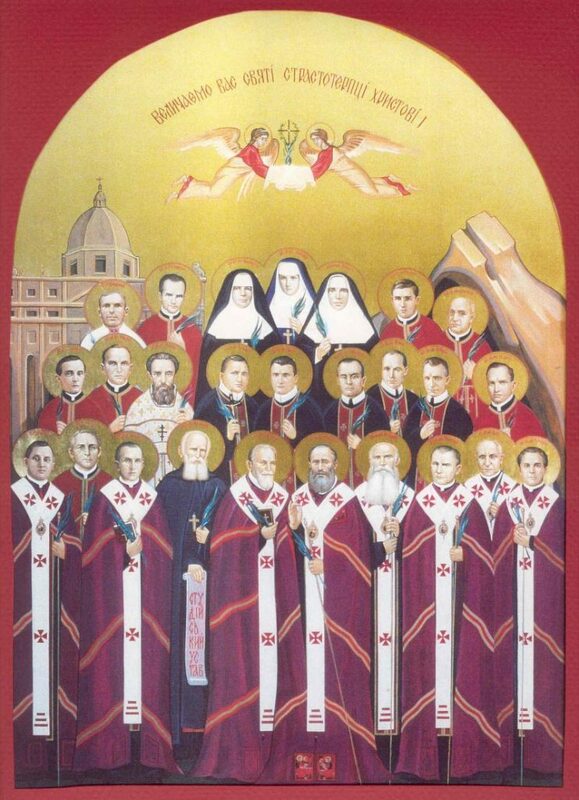 The following icon shows a few of the many people who lost their lives for their faith in God.